Below you will find a list of all the Play Club bonuses - offered to new players. The right side offers a casino overview (click to scroll through the images). Play Club Casino is an online casino that is bound to make waves for players. This latest addition in the casino market is a refreshing and fund brand designed with usability in mind and thus becoming a leading online casino for both and new experienced players alike. The site is very much, 'what you see is what you get'. Simplicity is the key after all and generates an effective and enjoyable user experience. If you're looking for the #1 slot site, then go to Play Club Casino. Designed to bring "Slots 'n Fun" your way! Launch in 2017, this online entity has yet to truly establish itself as a reputable gambling site in its own right. That said, the company behind the casino - Aspire Global International Limited - is a relatively recognised company in the world of online betting. With that in mind, players have every reason to expect a professional and astute service from this new casino brand. Become familiarised with this outstanding casino by reading our extensive casino review below. According to the casino host, during an exclusive interview, it was disclosed that this entity's popularity is on the increase amongst Canadian punters from Ontario and British Columbia due to its ever-increasing catalogue of online games. It is very likely that this trend will be expanding to other provinces as time passes. 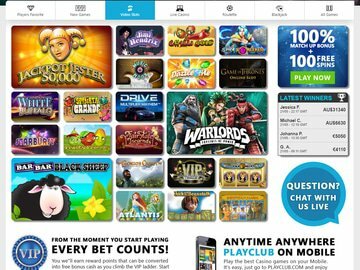 The Play Club online website has something for everyone, including a vast amount of bonuses and free spins, to make the experience as enjoyable as it can only be. Getting started on this website is bound to thrill you due to the attractive no-deposit welcome bonus. All new players receive a 100% bonus with the chance of winning up to £/€/$ 200 bonus as well as 100 free spins. No bonus codes required. Simply sign up and start enjoying the bonus. There are loads exciting promotions available on this website, and lots of other chances for players to experience thrilling benefits. There is the monthly cashback craze where you can get some money back from all that you have deposited within the month. Here, you receive additional free gifts, can benefit from tournament wins and there are plenty of other giveaways that you can enjoy. Other promotions will give players multiple bonuses, as well as lots of free spins making every moment that you spend on this website count. The VIP Loyalty Program has seven amazing levels for players to strive towards. The first is the new member level, where the main benefit is the welcome offer and fast cash out process. The next levels are the Bronze VIP, Silver VIP, Gold VIP, Platinum VIP, Premium VIP and Prestige VIP. By the time a player has become a prestige VIP, they are able to enjoy 100% bonus cash, 50 free prestige games, a personal offer from their personal account manager, and invitation only membership to this exclusive level. The casino is owned and operated by Aspire Global International LTD Smart and is powered by several distinguished software developers. An impressive list of providers includes giants such as NetEnt and Microgaming, as well as WMS, Elk Studios, Play'n Go, NextGen, Amaya, Realistic Games and Cadillac Jack. This immediately tells you that the collection of featured games surely includes Gonzo's Quest, Jack Hammer, Thunderstruck II, Immortal Romance, Foxin' Wins, Gemix, Bloopers, and plenty of other highly popular slots. What might come as a (nice) surprise is the presence of a number of exclusive titles, such as Fruity Friends and Reel Bandits from NeoGames. More modest in size, table games section still offers a decent selection of Roulette, Blackjack and Poker variations, as well as 3 Card Solitaire and Scratch n' Roll. Add to that a couple of Video Pokers, variety of Keno and Bingo games, and surprisingly large choice of casual ones, and it's fair to say each and every player is sure to find something to their taste. Even those who prefer to play popular table games while facing a live dealer. At the moment they can join one of 9 live tables and play a game of Roulette, Blackjack or Baccarat. All games can be enjoyed via a web browser or mobile. Devices include desktop computers, iPhone, iPad and Android. No download is required. This way, players will have a much easier experience with good download speeds and no crashing game issues. While mobile players can begin to play in demo even without any registration, players on a desktop have to set up an account to start playing. Languages supported by the casino at this point of time is restricted to English, Deutsch, Norsk, Suomeksi and Svenska. Play Club Casino is operated by Aspire Global International Ltd, which is a fully licensed operator under the Remote Gaming Regulations of Malta. The establishment utilises the latest SSL encryption technologies to guarantee that all personal and financial data is kept confidential. One of the main selling points of this casino is the fact that it is open to a wide international audience. This is no more evident than in the list of deposit and withdrawal methods. For Canadian players, there are plenty of deposit options available including eWallets like Skrill and Skrill 1-Tap. Debit and Credit card options include Visa and MasterCard. Other options available include entropay, wire transfer, clickandbuy, instadebit, UseMyFunds, Eco and Fundsend. For making withdrawals, methods that use Canadian dollars include Skrill, Skrill 1-Tap, Visa, MasterCard, entropay, Wire Transfer, click and buy, instadebit and Eco. Other methods are available, although they are a little more restricted due to the currencies that one can use. These include Ukash, Maestro, Payr, Paysafe card, iDeal, sofort, giropay, Neteller, eps, Poli, Ticket Premium, Boleto Bancario, Fast Bank Transfer, BankContact, A, Euteller, Trustly, Zimpler, Siru mobile and Transferencia. The establishment accept multiple currencies, including USD, GBP, EUR, SEK, NOK, AUD and CAD. Play Club Casino strives to achieve excellent customer support. Players can benefit from support 24/7/365 from 08:00 to 01:00 CET. Play Club's dedicated support team is on standby via live chat, telephone and email to answer all questions you might have about your account. 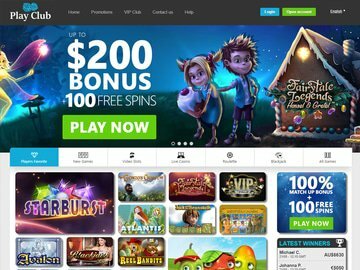 With Live games, casino games, video slots and many other games, the Play Club Casino is a gambling site worth trying out. With many variations in games from top software developers, varied payment options in place and efficient customer supports offering fast responses to customers, this casino means business. If you have not tried out this site yet, it is time that you pay a visit. We at Grizzly Gambling can really recommend Play Club Casino for players from Canada and all around the globe.